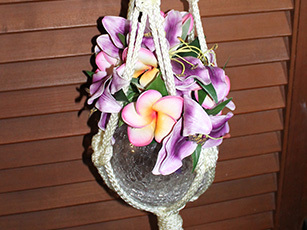 The Square knot and Josephine knot used to create this piece results in a simple yet stylish macrame pot hanger that you can hang either inside or outside of your home. 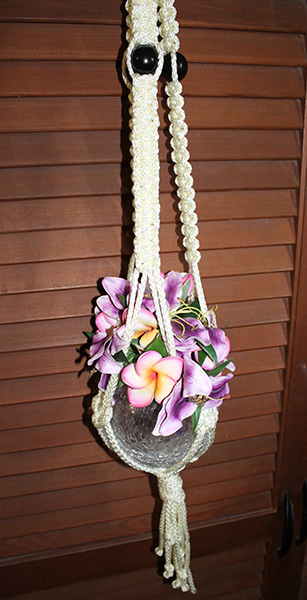 It will hold a 15 to 22cm diameter pot or bowl and is a suitable project for beginners to intermediate macrame enthusiasts. 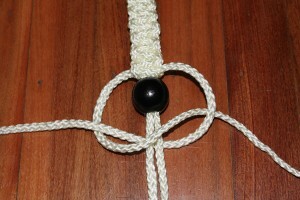 In this example the 6mm Ivory Bonnie cord was used together with black 32mm beads. Edit: I originally designed these instructions for three groups of cords (which is what is shown in the pictures) but have since been informed that is much more attractive with four groups of cords. The instructions and supply list below have been modified to suit but the pictures haven’t been fixed yet. 1. Cut the 44m of 6mm Bonnie cord into 4 x 6m (working cords) and 4 x 5m (filler cords). 2. 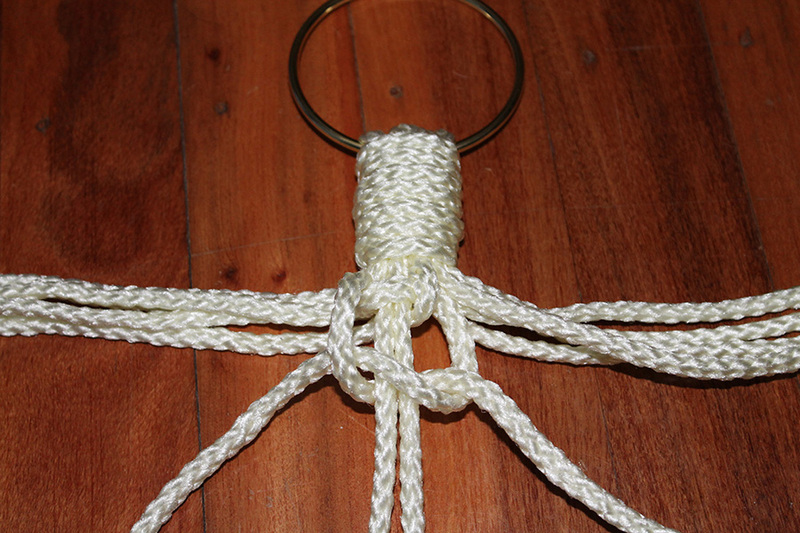 Find the centre of all 8 cords and pass them through the brass ring so there is an even length on each side (i.e. 2.5m or 3m). 3. Gather all cords together and create a gathering wrap (approx. 4cm in length) close to the brass ring (fig 1.). Trim any excess wrapping cord. 4. Divide your cords into 4 groups of 4. Make sure you have 2 smaller and 2 larger cords in each group. 5. With one group place your 2 smaller cords into the centre next to each other and start the square knot with one of the larger cords and close to the gathering wrap completed in the previous step. 6. Continue with the square knot for 20cm. 7. 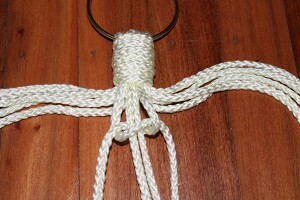 Add one bead by placing the 2 filler cords through the centre of the bead. 8. Continue with the square knot under the bead for another 20cm. Your 2 working cords will sit around the bead. 9. Repeat steps 4 – 7 for the three remaining groups of cords. 10. Drop down 15cm from the end of your square knot and alternate cords i.e. 2 cords (one filler and one working cord) from the right side of one group and pair up with 2 cords (one filler and one working cord) from the left side of the group of cords next to it. 11. 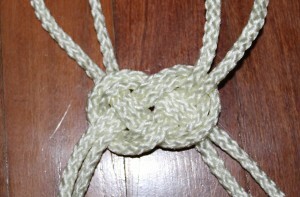 Make a double cord Josephine knot with each group of 4 cords. Tighten this knot making sure the 2 cords used are sitting side by side. 12. Repeat steps 9 – 10 for the remaining cords being careful to take alternate cords next to each other to avoid crossing over. 13. 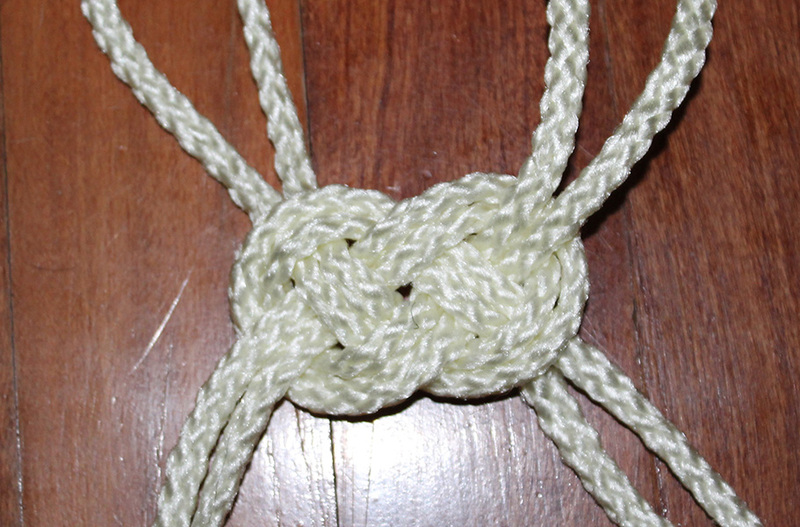 Drop down 10cm and create a square knot using alternate cords from the previous step. Repeat for all cords. 14. 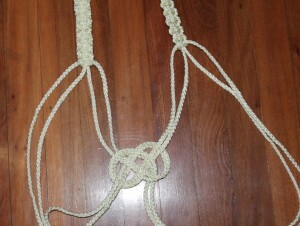 Make a final square knot directly underneath the one formed in the previous step for all cords. 15. Create a gathering wrap at the base (approx. 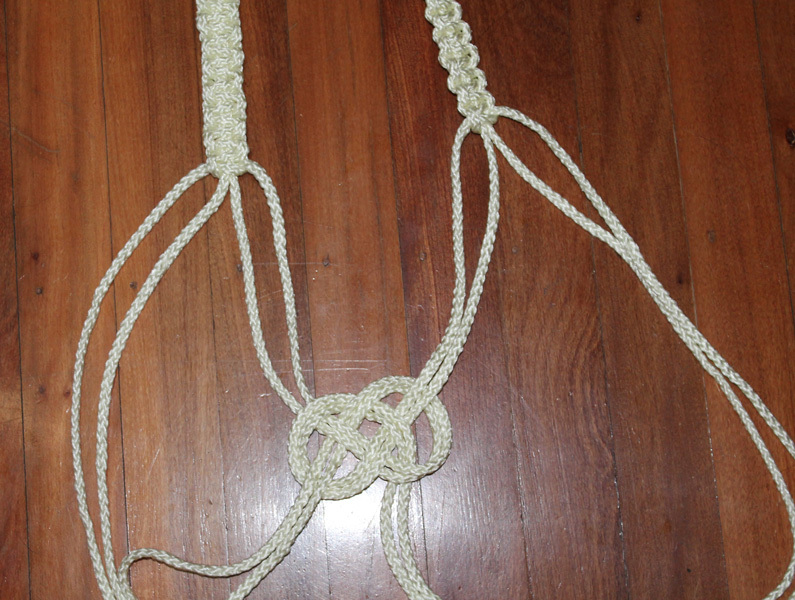 4cm in length) underneath the last row of square knots and trim any excess wrapping cord. 16. Make an overhand knot on each of the 8 tail cords (You can make these to whatever desired and differing lengths you like) and trim excess cord underneath the overhand knot. 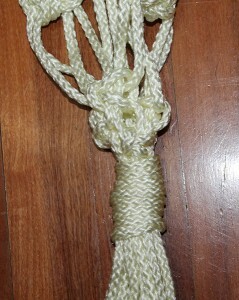 Unravel the ends of the cord by rolling it between your fingers to create a fluffy-end finish.